While the Boyz II Men origin story is rich with R&B history – brought together by a love for a cappella doo-wop harmonies, named after a New Edition song, discovered by Michael Bivins (New Edition, Bell Biv DeVoe) – it was the group’s unbelievable string of hits in the early 1990s that cemented their own standout place in the R&B canon. With the vinyl reissue of their first two albums – Cooleyhighharmony and II – courtesy of Motwon/UMe and Respect the Classics, it’s easier than ever to remind yourself of their 90s-flavored vocal group superiority. Cooleyhighharmony was Boyz II Men’s debut album and was first released on February 14, 1991. Since the single for "Motownphilly" was released in January of that year, I had requested the tape of Cooleyhighharmony as the #1 thing I wanted for my birthday in March. Because of my slight obsession with the group, I ended up getting three tapes of it from different people as presents. I wasn't the only one in love with it though. The album hit #58 on the Billboard 200 its first week of release and went all the way to #3 on the back of hit singles “Motownphilly” and “It’s So Hard to Say Goodbye to Yesterday.” Cooleyhighharmony has been certified 9x platinum and is often placed on “best of” lists for 90s albums due to the foursome’s unmatched vocal interplay and their unique, coordinated aesthetic. While the band had two other non-album singles released around the same time – “End of the Road” from the Boomerang soundtrack and their cover of “In the Still of the Nite (I’ll Remember)” from The Jacksons: An American Dream soundtrack – this vinyl reissue maintains the original’s 10-song tracklisting and artwork, making it more of a rarified collector’s item than the last few reissued editions. II was Boyz II Men’s follow-up to Cooleyhighharmony and it was released on August 30, 1994. It was the album that skyrocketed the group to national and international success. One of the most unique elements that watermarked the juggernaut success of Boyz II Men during this timeframe was their ability to not just top the charts, but top themselves as well. Their back-to-back #1 singles – “I’ll Make Love to You” and “On Bended Knee” – replaced each other at the very top of the charts, a feat that had only previously been achieved by Elvis Presley and The Beatles. “Water Runs Dry” also became a Top 5 hit for the group, reaching all the way to #2. Overall, the album spent five weeks at #1, it won the very first Grammy award for Best R&B Album, and it has been certified 12x platinum since it was first released. The very next year, Boyz II Men would do even more to solidify their supremacy by dueting with Mariah Carey on "One Sweet Day" from her Daydream album. When that one comes on in the car, you better believe I can make my way through all four parts. 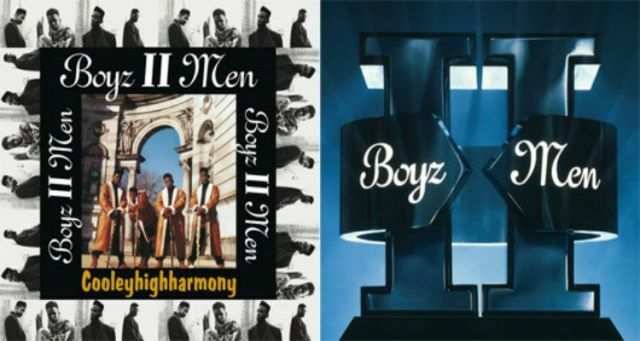 Cooleyhighharmony and II launched Boyz II Men’s career and firmly sealed their legacy in the pantheon of R&B vocal groups. Listening back through these vinyl reissues – to both the hits and the deep tracks – it’s simply amazing to hear how quickly and completely it all started for the guys.